some German player and Lindsted. Back in 1981, the USA had experienced more than ten years of decent league competitions in their own North American Soccer League (NASL). At the time, Americans fully understood how exciting a soccer match could be, even if goals (points) were limited, compared to basketball and American Football. 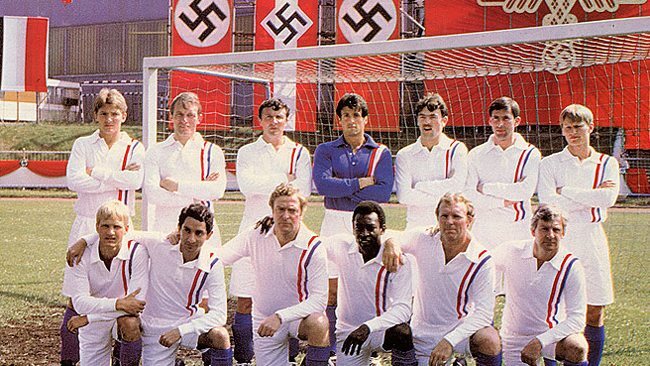 Combined with a heroic escape from imprisonment in WWII, big Hollywood stars John Huston (director), Sylvester Stallone and Michael Caine adapted a Hungarian movie into Escape to Victory (in the United States simply called Victory) and invited both famous and less famous real life soccer players to join the cast. 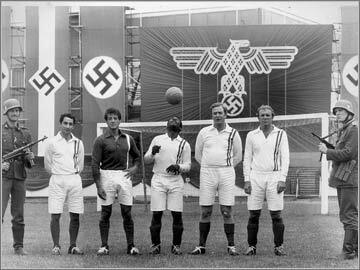 A soccer match between the German national team and a team of POWs is used by the German Nazis for propaganda - to show the world they are superior. That game is played in Paris, and an escape plan is set up for the match, with the French resistance digging a tunnel from the sewer system straight into the dressing room of the POW-team, enabling them to flee underground. In the end, the soccer players don't use the sewer but decide to stay and finish the match. After the game ends, the crowd of French spectators pour onto the field causing confusion as they hide the players amongst them, swapping clothes with the players, so they can get away safe and without being noticed. Front row: Thoresen, Ardiles, Caine, Pelé, Moore, Prins. At first it looks like the Germans have nothing to fear from the Allied players. Playing rough and mean (as you'd expect them to) they easily get a 4-0 lead. At halftime the escape tunnel is ready, but the POWs want to stay and finish the game, confident they can win; at the same time risking their one and only opportunity to get away. With Pelé injured on the bench, the POWs score three goals. Then, Pelé, holding his injured stomach, returns onto the field. He starts dribbling away like he has no teammates, but does score with a wonderful overhead kick. That levels the score 4-4. The 5-4 lead, by Belgian Paul van Himst, is disallowed for dubieus reasons. In the very last minute, Osvaldo Ardiles makes a late tackle, causing a penalty for the Germans. German captain Baumann, played by Werner Roth, takes it, but Sylvester Stallone (cheered on by the French crowd) saves it brilliantly and gets the team their well deserved draw. It's obvious that the movie means every star in the movie to have his moment of glory. So Stallone saves the penalty, and the goals from the POW-team are scored by the three World Champions Bobby Moore, Osvaldo Ardiles and Pelé (the all-important last one), and by rising star John Wark. Especially the goals by Moore and Ardiles are a bit strange, as they really didn't score that many goals during their career in real life. During the match - although substitutions wasn't part of the game in those days - Kazimierz Deyna replaced John Wark and Co Prins was substituted by Hallvar Thoresen. It's interesting to see who all participated in this movie. The soccer players that were invited, ranged from the world famous to the barely known. 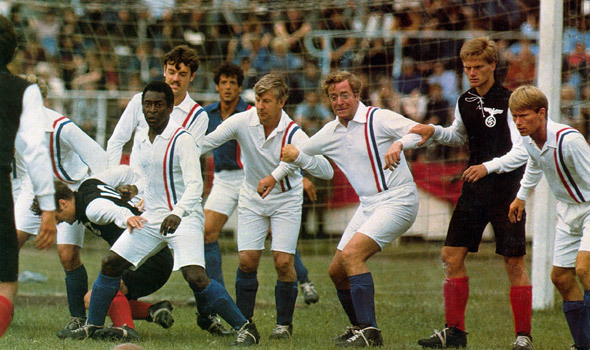 First and foremost, the movie obviously had to have some appealing soccer players. Pelé (World Champion 1958,1962 and 1970), Bobby Moore (World Champion 1966) and Osvaldo Ardiles (World Champion 1978) fitted that description. Other big stars were Polish legendary number 10 Kazimierz Deyna, Belgium's all-time best Paul van Himst and Ipswich Town-star John Wark (14 goals in the winning 1980-81 UEFA-Cup campaign with Ipswich). 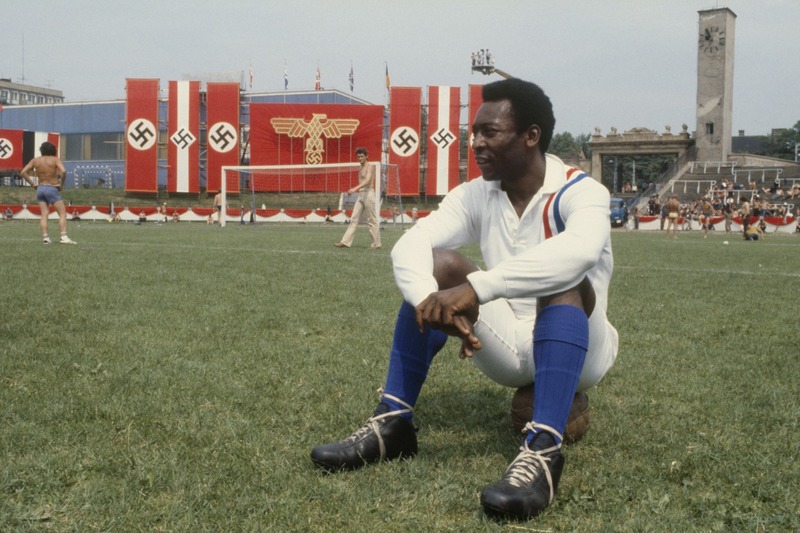 The producers were also looking for soccer players from other countries that were occupied during World War Two. So Norwegian Hallvar Thoresen was asked and he brought along his Danish teammate from Dutch club FC Twente, Sören Lindsted. The latter not being first pickings, but accepted after Allan Simonssen and the likes, rejected the offer. Interestingly, Co Prins (nearly 43 years old at the time, and not all that famous) was approached to represent The Netherlands. World Cup-stars like Willem van Hanegem, Johan Neeskens or Wim Rijsbergen (all of them played in the NASL) would have been more suitable. Having Pelé already on board asking Johan Cruijff wasn't a real possibility, as it would only cause friction between the two best players of the world, regarding their role in the movie - as only one can score the final goal. Finally, Yugoslavia-born American Werner Roth played the German captain and was invited as Pelé's teammate at New York Cosmos. To complete the team, the producers paid a visit to an Ipswich Town training (they already had John Wark on their list) asking if anyone would like to participate. Russell Osman, Mike Summerbee, Kevin O'Callaghan, Kevin Beattie (stand-in for Michael Caine), Paul Cooper (stand-in for Sylvester Stallone), Laurie Sivell (as the German goalie Schmidt) and Robin Turner all said yes. The first five all had decent careers in soccer, but for Sivell and Turner - being part of (Escape to) Victory - was definitely their highlight of their soccer days. *The movie was a remake of a Hungarian movie, Két félidö a pokolban - Two halftimes in Hell, loosely based on a true story. The film stated - for cinematographic and dramatic reasons - that all Dynamo Kyiv-players were shot after one match they won against a German team. The real story is that the Ukrainian team played a series of matches against German opposition while being occupied, winning them all. After that, the whole team was made prisoners of war, of which in the end only a few survived. * The scenes at the soccer stadium are shot in Budapest, Hungary, the home ground of MTK Budapest. * Legendary goalkeeper (and World Champion 1966) Gordon Banks taught Sylvester Stallone the basics of goalkeeping. * It took some lengthy and persuasive discussions to convince Sylvester Stallone that it would be unrealistic if he as a goalie would score the final goal. * Most players didn't take acting too seriously. More than once the Ipswich Town-players showed up at the movie set with a hangover from the night before. Polish midfielder Kazimierz Deyna topped the team by drinking vodka as were it lemonade. * English actor Michael Caine couldn't play soccer to save his life. * After trying (and failing) over a hundred times, it was decided that Pelé's overhead kick would be filmed in different shots. Pelé would just have to throw the ball into the air until he got it right. * Hard-boiled actor and former soccer player Vinnie Jones has been planning to do a remake of the movie for over three years, with possibly David Beckham in a star-role, given his popularity in the USA. Most people think it's a bad idea.